A little bit ‘specfic,’ a little bit lit n’ period piece, partway through the Looking Glass but with one foot rooted to the ground. With a linguist’s love of language, a writer’s drive to tell stories, and a chromaphile’s delight in color and visual impact, I hope to entertain you here, on my blog, and via my short stories and novels. Asset Creative House has picked up the first Victorian Dead novel. We'll be publishing a second edition of it in 2018, while I work on getting Book 2 ready go. Love working with Tessa and her marketing plan! My second WRITERPUNK anthology. I'm thrilled to be in it again. Literature you might have read in English Class, all punked up and ready to be re-read for the joy of good story meets the the fun and fantastic. The anthology title, What We've Unlearned, is from a Mark Twain quote. How most of what we learn when we get educated, is unlearning the wrong stuff. What have we unlearned? Try the stories and see! My story in it is called, Of Folly and Fallibility. A Space 1899/steampunk adaptation of Jane Austen's Northanger Abbey. Where the British Empire has expanded out into the inner solar system. On Venus as it might have been were it much as scientist/thinkers speculated at the time. Where the main characters has, perhaps, read too many stories about pernicious aliens and their plots to take over humanity. You can find English Class Goes Punk: What We've Unlearned on Amazon/Kindle. We just had the launch party at ORYCON 38 for NIWA's new anthology, ARTIFACT. My story is called 'Suspended Animation' and it's a 5,000 word SF tale. What if you woke up in the tank you'd been suspended in for lengthy space travel to find aliens had broken into the ship? Worse, your crew members call you the glorified 'cruise director,' but the ship's AI woke you up to stop them, so you now have to find a way to defeat them without leaving the tank or alerting the aliens to the fact that you're awake. ​This anthology from the Northwest Independent Writers Association presents nineteen “artifact” stories, each with a different interpretation of the theme. In these pages meet a werewolf with daddy issues, an android driven mad by time and an alien artifact that will make you cry. You’ll travel to worlds filled with magic, visit unique cultures, and move through time. So whether it’s stories with deadly aliens or friendly witches, advanced alien technology, or strange things that go bump in the night, you’ll find something to enjoy here. It has a 5 star rating on Amazon. It's won three publishing awards. And been accepted into the prestigious catalog of the National Poe Society in Baltimore, MD. My thanks to the people of Writerpunk for including my story, and my admiration for how well laid out and beautiful designed the whole anthology is. All profits from the sale of it go to PAWS in Lynnwood, WA, a pet rescue and wildlife rehabilitation organization, to help them expand their facilities and save more lives. As usual I didn't get as far through the novel as I thought I would, but all the rethinks, rewrites and edits are making the story better and stronger, which makes me so happy. for National Novel Editing Month (March 2016). You're welcome to join us—you can register at the NaNoEdMo website. Free and open to all writers. Just got good news. 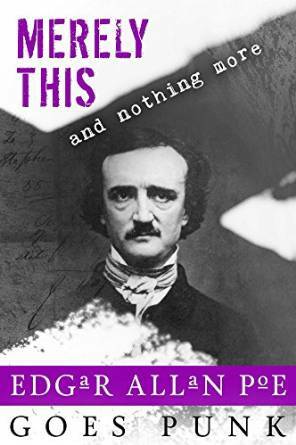 Writerpunk has accepted the short fiction I wrote for their next anthology, Merely This and Nothing More: Poe Goes Punk. So it's steampunk and other 'punk' genres. Mine is an adaptation of Poe's The Angel of the Odd, called Oddball. and matches the new What the Faeries Left Behind cover better. Night of the Victorian Dead, Book One: Welcome to Romero Park is out now on Smashwords! Night of the Victorian Dead, Book One: Welcome to Romero Park is out on Kindle! ​I'm one of the authors of zOctober, a month-long revelry in fiction of the zombie persuasion. ﻿Stop by the Facebook event any time during Oct for all kinds of zombie-undead related fun, talk and giveaways.﻿ I'll be a featured author on October 7th, and on the Facebook event with a book giveaway of Victorian Dead. Post an image on the event page in the evening that day, and I'll turn your face or your dog into a zombie and post it back for you! Defense Mechanisms is now also available on BarnesandNobles.com. And on the iBookstore, Smashwords, Kobo and Amazon/Kindle. And is just up on Diesel and now Sony.com. And Oyster. Thirteen stories featuring the number 13 | Released Nov 8th 2013 and available on Amazon. Though the project wasn't funded, see the video I made for it! I gave a reading, a book giveaway, Q&A and an interactive presentation on making your least favorite chores more fun! The Reed campus is beautiful in summer, come walk the canyon and then drop in the bookstore. I sold books at the NiWA table Fri & Sat, May 25-26th 2013. Kathy Meis of Bublish (@bublish) interviewed me on Twitter Thu, May 16th 2013. Read the whole thing here, or on Storify. What the Faeries Left Behind, my novella, is out. An urban fairy tale for adults, it's available in print from Amazon and electronically from Amazon Kindle, BN.com, Smashwords, Kobo.com, the Sony.com store, and now the iBookstore. Also through Goodreads, Bublish and Wise Grey Owl. See My Books for more about it. Why is this website done white-on-black rather than the standard black-on-white? Because that's how I write. My lap top and computer are both on the white on black setting because it's a lot easier on the eyes, esp. grey type on a black background. So this is my native writing and working environment. Put up the Spring Fling giveaway promo & link, and shared my EdMo win and the winner icon. Announced NaNoEdMo 2016 and shared one of the Participant icons I made for it. Added new links where Victorian Dead is available, added a new Photo of Wonder, and the cover for the 2014 NIWA Anthology. Added the book bar to home page. Updated the Links page with two authors and an artist. Announced and put up the new cover for Defense Mechanisms. Added a subscription bonus to the newsletter sign up. Announced and put up new cover for WtFLB, and added new draft covers for SW and Victorian Dead. Posted a new post on Das Blog, called Our Love-Hate Relationship with Fantasy. Posted a new post on Das Blog, called Adults Playing. Put up a better summary of one of my short stories, Mind Games. Added a new review of Defense Mechanisms, and posted a new post on Das Blog, Take Back the Wonder. Posted a new post on Das Blog, called Doctor Who is Adults Playing. Added a book page for the first book of Night of the Victorian Dead, and announced the cover reveal. Added a review of Defense Mechanisms to the book page under My Books. New blog post on Das Blog. Announced ABNA submission, added an excerpt from B&G Bk 1 to the Excerpts page, and updated B&G Bk 1 on the All Stories page. Added the Sony.com buy link for DM, announced the 2013 NIWA Anthology. Added a blog panel for my Prism Casts cards for sale at Zazzle and announced being author of the week on the Goodreads indie group. Added the iBookstore link to buy DM, and posted about being up on One Thousand Worlds. Added the BarnesandNoble.com and Kobo links to buy DM. Added a review to the WtFLB book page, and posted a link to me newest guest blog post. Added Amazon/Kindle buy link for DM. Added iBookstore buy link for WtFLB. Announced the first release of Defense Mechanisms on Smashwords and added a link to it. Announced and added a link to the WtFLB book trailer teaser on the WtFLB book page. Added a Chromatic Daffodil Shadows slideshow to the Chromatic Daffodil Shadows page. New blog post for Caution: Adults Playing, updated events and gave an update on the release of DM. Updated home page news, and added the Prism slideshow to the Photos of Wonder page. Updated home page news and the DM book landing page. Added content to the Defense Mechanism book landing page, and set up the new My Books page with both novellas and the two coming novels. Invited people to order advance copies and be part of the Kickstarter campaign, and announced my first guest blog post. Updated author events and announced the KS campaign. Updated author events and added a new one. Added two new author events. Put up a new Photo of Wonder. Put up my Bublish author interview (under the My Book tab), and announced book table @ Wonder NW. Announced my first online interview. Added a second post to the C: AP blog. Added a new page, Interview, under My Book, for being featured in The Literary Midwife newsletter. New guest post for Das Blog, updated the home page book announcement, and added social media links to the top right hand icons. Added EdMo icons, and an EdMo write-up to the Writing Life, plus updated goals there. Added WtFLB Sony.com store link. Added WtFLB Kobo link, added an excerpt for 'Suspended Animation,' updated goals, and added a Goodreads review widget. Added WtFLB Barnesandnoble.com page link, and a Goodreads book widget. Posted to Das Blog, #2 on FCI. Added a mini-bio to My Book, and the link to What the Faeries Left Behind on Amazon. First introduction installment of the Caution: Adults Playing blog (under Das Blog). Added an excerpt of What the Faeries Left Behind and the link to buy it on Smashwords to My Book; and added a new page, Writing Work 2012, under The Writing Life. Building My Book page, added a new Photo of Wonder, restored lost graphic from home page. Announcing the release of What the Faeries Left Behind, and the addition of the My Book page. Able to access this again! Changed Das Blog (Beware Writing Rules) to Writing Blog and added a new blog as Das Blog for Caution: Adults Playing. Couldn't even access this site until I got a new (used, but newer) laptop and OS. Grrr. Laugh. Lost the changes I made due to incompatibility issues with my computer. Added a new blog post on Beware: Writing Rules in the defense of adjectives and adverbs everywhere. Updated my writing goals post Willamette Writers conference. Began updating the bio. Added a new Photo of Wonder, and a new graphic to head the contact form. Added two short story excerpts to the Excerpts page under Stories. Updated the description of Blood & Glitter under All Stories (under the Stories tab) after working up an improved pitch for the Willamette Writers conference. Updated the All Stories page to include my two new short stories. Added links and blurbs for Alex Hughes to Linkage. Added my first excerpt, the opening of FCI. Updated writing goals. Added a third Photo of Wonder. Started a page for links to other cool writers called Linkage. Added a second Photo of Wonder. Linked the SpecLit Society page to the SpecLit Society website. Made second blog entry on Beware Writing Rules. Updated writing goals. Added pictures and graphics to the three new pages. Made first blog entry on Beware Writing Rules. Updated writing goals. Changed the tab named 'Pitches' to 'Stories.' Moved the overview of my stories to its own page under Stories. Added a page for the SpecLit Society. And added Das Blog, for pursuing the topics of Beware Writing Rules, and our love-hate of FCI. Posted three Chromatic Daffodil Shadows images from last spring, and added a link to my Cafe Press site. Updated writing goals. Posted the first Photo of Wonder. What do you think it is? Updated writing goals, and added a new page: Writing Accomplishments in 2011. Happy New Year! Updated writing goals. Added my screenplay titles and blurbs for them, plus an intro to The Writing Life; updated the writing goals there; added to the Home page. I'll be posting new stuff pretty frequently for a bit until the site is set up, but generally I plan to add content and update things every week over the week-end. This will include updates on my writing projects, goals, process and progress, and other fun upcoming features. We'll see where it evolves from there.